This is not so much of a new post as a republishing of something that already exists on a third party site but there is a reason for it beyond lazy blogging. Yesterday, I found myself rummaging through Delicious as I needed to use various Twitter tools I’ve either used or which have featured on, for example, Mashable, over the years. They were all neatly saved in my tags, but when I came to use them something like half of them led to redundant sites. 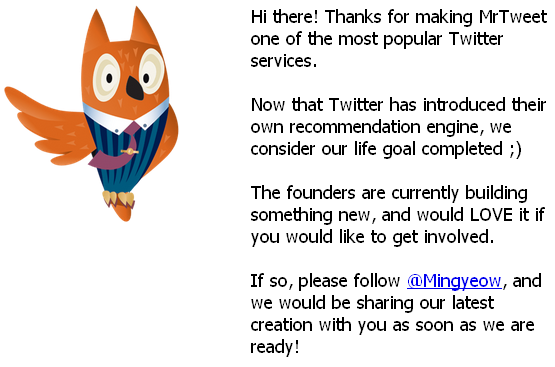 That included the well-established Mr Tweet, which I always thought was an excellent tool (if a little annoying with the DMs) and far better than Twitter’s own recommends ofo people to follow. Along with the rest of the online world I saved my Delicious bookmarks as a csv file within seconds of Yahoo intimating it was thinknig of closing the site. And when Seesmic closed its video operation last year I thought about moving my videos and then decided it was a job too far (it involved emailling them and asking for the content) in a fairly hectic period of my life. So, as far as I know, those videos (including a before-and-after of my epic hair cut, and all the lovely people who videoed their thoughts on it) are gone.More pertinently, I suspect a lot of people who crafted blog posts that included embedded Seemsic discussions are now missing content if they search back in their archives. Of course, those videos weren’t particularly import but – extreme example, I know – what if Google was to close Blogger? Shifting three years-plus worth of content from this blog elsewhere would be a piece of work. And as a journalist, creating and embedding content up using curation or visualisation tools – like Storify and ManyEyes, both of which I like a lot – doesn’t mean you’ve crafted a work of permanence. So, along with the idea of backing up as much of my data as I can (and accepting that, sometimes, things just come to an end) I’ve moved a piece of crowdsourcing that is very close to my heart onto this blog. It’s the Journalism Cliches I Most Dislike list, which I started on Listiki and which so many talented and funny people took the time to contribute to. Of course, Listiki still exists and I’m not suggesting for a moment that the site is likely to go away – I hope not, it’s great – but I also would hate for this to get lost because I enjoyed collaborating on it, and so I’ve cut n pasted it here. An uneasy calm descended on X (place, frequently war-torn) one day after X (violent event). Meaning: There’s no story today, but we have to write summat. In an inte, “what’s it like….” to…, when… followed by some reference which couldn’t possibly be “lik” anything else. “Licence fee payers reacted with fury”. Did we really…? Only cute girls pass exams. Grisly murders. Or brutal ones.